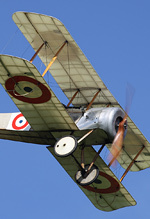 Following two exceptionally well-received and well-attended events in 2016 and 2017, Shuttleworth's Fly Navy Airshow returned for 2018 and whilst the finalised list didn't quite match up to that of the previous two shows on the theme, and had seen several juicy withdrawals, it was still a more than appetising line-up with plenty of visiting aircraft joining the more regularly-seen based machines. 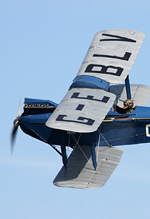 Dan Butcher reports from Old Warden. Photography by the author. Most notable amongst the drop-outs from the first published list was a TBM Avenger, reported by Aeroplane Monthly to be a French-registered example in attractive Fleet Air Arm colours. 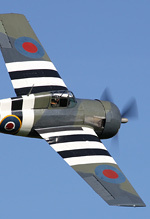 Joining it were Kennet Aviation's perennial non-attendees of Seafire XVII and Skyraider. The Fighter Collection at Duxford conversely have been a fixture at the Fly Navy shows, though their trio of US Naval types became a pair when the Bearcat also succumbed, and their Hawker Nimrod Mk.I was unable to take its place alongside Historic Aircraft Company's Mk.II and the Hawker Demon. It's at this point that such an uncompromising focus on the theme can become problematic, as replacement aircraft that not only fit the bill, but that carry the same star-power start to become thin on the ground. Several aircraft that had flown at Fly Navy shows of the past two years were unavailable for various reasons, and in the end The Collection were forced to substitute in representative aircraft where they could. Newly-restored Spitfire Vc AR501 was given a chance to shine in the absence of a Seafire, and for the third straight show this year the BBMF's Avro Lancaster was called upon to inject some of the excitement that their sensational performances had done for both the Season Premier and May Evening shows. By the time the BBMF arrived for their mid-afternoon mini-display however, it had already become obvious to regular attendees that something had changed at this airshow. 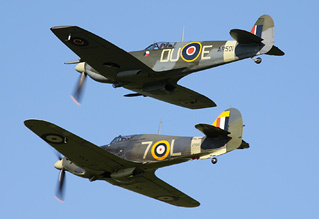 From the outset, the pairing of Sea Hurricane and Spitfire that opened the show did so without the spectacular bend-taking topside passes upon which much of Shuttleworth's world-class airshows have forged their reputation, and they were far from the only ones. 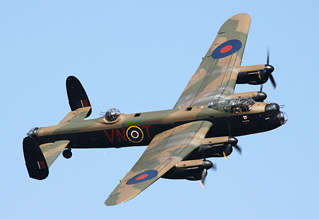 The Lancaster's performance in particular offered a direct comparison to the sequence flown a fortnight earlier and the change was quite perceptible to those that had attended both displays. Where the opening pass from the south had previously been a gloriously banked turn flown along the curved crowdline to the control tower and beyond, this time PA474 was levelled out along the runway heading before reaching the tower. It was evident the crew were doing their best to deliver what they could, and by the BBMF's normal standards these were still excellent passes, but they didn't wow spectators or photographers in quite the same way. This was true for much of the flying display. Things felt just a little bit more distant, a little bit higher and without the bend some of the Shuttleworth magic was absent. This doesn't mean that Fly Navy was without merit, nor was this a "bad" airshow. In many respects it was the lesser-celebrated acts that excelled while the larger piston warbirds struggled to make an impression. This was due in part to the "new" display axis, but also down to them flying routines better suited to larger airfields where the crowd don't expect the same intimacy that an Old Warden audience does. Chief culprits here were Air Leasing's Hawker Fury ISS and the Royal Navy Historic Flight's Sea Fury T.20, and though The Fighter Collection's heavy metal of Grumman Wildcat and Goodyear FG-1D Corsair were far from blameless on that count, both did at least come down to low level to close their displays with curved passes after their aerobatic routines. The TFC pair really made their mark on Fly Navy by operating off the grass strip at Old Warden. 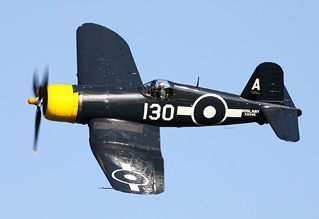 In the case of the Corsair, it was claimed to be the first time ever that a "bent-wing bird" had landed at the airfield and it was certainly a welcome surprise when announced by lead-commentator Ben Dunnell. It always adds much to the overall impression an aircraft can make on an airshow when they're available for close-up inspection on the flightlines and you get to experience the power during a take-off roll; the contrast to the RNHF Sea Fury's cameo was stark. Kudos to TFC and Shuttleworth for making this happen. 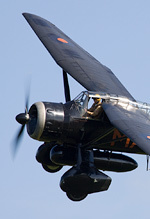 The Navy theme naturally ran through bulk of the flying programme, with the RNHF's other flying contribution being their Fairey Swordfish I W5856. Relatively rare on the circuit in recent years, this was a welcome sight at Shuttleworth and while the display was rigidly the one we are used to from military teams and in no-way tailored to Old Warden's layout, the charismatic type made a graceful impression. Also seldom seen on the display circuit is Tony Whitehead's stunning Moraine-Saulnier MS.317, finished in a very pleasing sky blue French Navy scheme. Prising rare UK-based machines from hiding to appear at Shuttleworth is something which is always appreciated, and goes a long way to varying line-ups which are often dominated by airframes based at the airfield. Other notable flying visitors included Plane Sailing's Consolidated PBY-5A Catalina "Miss Pick-Up" and a Shuttleworth debut for The Gazelle Squadron's duo of helicopters, with a third machine of theirs joining a Royal Navy Merlin on static display. 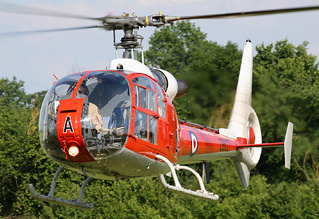 This was the first time I'd seen the Gazelle Squadron in action and it was quite a pleasing routine, although one that felt like it was perhaps designed for more aircraft, a pair not quite able to cover enough ground along the crowdline, especially during the well co-ordinated hovering segment. They do plan to double their number to fly as a four-ship in future, and with an array of authentic service colour schemes on strength to keep things interesting, this is a display team to keep an eye on. For the third straight year a Westland Wasp made an appearance in the flying display in the capable hands of John Beattie, and to the organiser's credit that repetition has been kept interesting by virtue of a different aircraft on each occasion, this year seeing a very rare outing for an ex-South African example. An unexpected star turn was Mark Miller's gorgeous display in his de Havilland Dragon Rapide - flown almost from the moment the wheels lifted in a manner which was more reminiscent of a Collection pilot than a visiting aircraft. With the weather once again on good form, conditions were calm enough not only for the Collection's fleet of First World War machines to take to the air, but also for no fewer than four of the famous "Edwardian" machines, namely Bristol Boxkite and Avro Triplane replicas, and the original examples of Deperdussin and Blackburn Monoplane. At any other airfield this would have been considered an exceptional airshow, with a varied vintage mix of aeroplanes, a strong and well-supported central theme and glorious sunny weather, yet the flying display felt oddly flat. To remove the "bend" at Old Warden robs this wonderful airfield of much more than just a few topside passes for the photographers, it strips Shuttleworth of what makes this for so many their favourite and "go-to" airshow venue. Without it, of course it doesn't stop being Old Warden nor prevent it being a very fine place to watch aeroplanes, but it just eats away at the magic. We have plenty of places where you can go and see a just-so air display that will scratch your aviation itch for a while, but Old Warden is much more than that - and to remain so, we must all dearly hope that the iconic bend is back with a vengeance by the time of the next show there.